A mobile business teaching children across Australia’s rural and remote communities to write code has been crowned the winner of Mercedes-Benz’ inaugural ‘Hack my Van’ competition. The initiative was launched by the car manufacturer’s marketing team in partnership with creative agency, The Royal, as a way of engaging entrepreneurial small business owners and thinkers with its new Vito van. 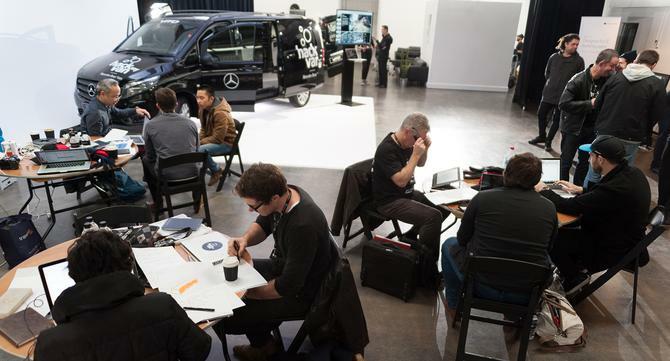 Six finalists were selected from a nominations process online to participate in a one-day hackathon on 6 August that saw them ‘hack’ the inside of the Mercedes-Benz utility vehicle. Code Camp innoVito by Cobalt took out top honours for its efforts to teach children to write code. The initiative started in December 2013 and over the past 18 months has taught 8000 kids to write code in both public and private schools. The aim is to reach 100,000 students in the next 12 months, and Code Camp is already running classes in Arnhem Land with the assistance of the Foundation for Young Australians. The team behind Code Camp won a new Vito van on the day, leading a pack that also included a biohacking lab, mobile pet photography studio, rubbish to product recycling van and on-demand 3D printing workshop. The finalists were judged by several innovators and celebrities including award-winning chef and restauranteur, Shane Delia, Mercedes-Benz MD for A/NZ, Diane Tarr, Huffington Post’s Cathy Anderson and Unlockd and Tribe advisor plus co-founder of Smiling Mind and LaunchVic board member, Jane Martino. Mercedes-Benz marketing manager, Katherine Gracey, previously told CMO the program was about extending its customer base outside of traditional trade sectors and highlighting the vehicle’s innovative technology make-up.